Officials identified the three victims in the plane crash as crews search for a possible fourth victim. 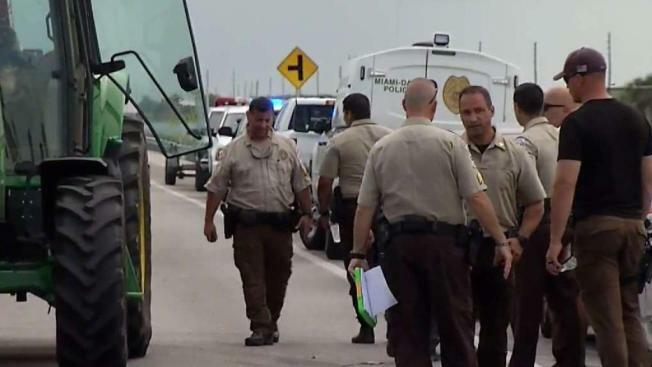 Rescue crews began the search Wednesday for a fourth possible victim after two small planes collided in midair and crashed in the Florida Everglades in Miami-Dade Tuesday. The collision happened around 1 p.m. near 22700 Southwest 8th Street about nine miles west of Miami Executive Airport, officials with Miami-Dade Fire Rescue and the FAA said. Jorge A. Sanchez, 22; Ralph Knight, 72; and Nisha Sejwal, 19, were identified as the victims in the plane crash. A preliminary investigation revealed both planes were training flight students, with two people in one plane and two in the other, Miami-Dade police officials said. A search for any additional victims started at sunrise. Footage showed the badly damaged planes, a Piper PA-34 and a Cessna 172, in a grassy area of the Everglades. Crews responded to the scene by helicopter and airboat to recover the bodies. The wreckage of both planes had the name of local flight school Dean International on their sides. The school has been involved in a number of incidents involving planes, most recently a crash in the Everglades in May that left two hospitalized. NBC 6 last year obtained reports by the National Transportation and Safety Board and Federal Aviation Administration of downed planes at Dean International. Since 2007, a total of 29 accidents or incidents have been documented, including five fatalities. The FAA said they are investigating the crash along with the NTSB.